Overture Founder Launches Tweetup, "Adsense For Twitter"
idealab, the incubator behind the company that invented search engine marketing as we know it today, is launching a new startup that they say is applying some of the same business mechanics to the Twitter stream. The new startup is called Tweetup. Let’s zoom back to 1998 for a minute. Search engines at the time had no real way to monetize traffic beyond normal ads. Then Goto.com came along and turned that world upside down by allowing people to bid to be at the top of search results for whatever keywords they wanted. The rest is, well, history. GoTo was renamed Overture, went public and was later acquired by Yahoo for $1.6 billion. Google later settled IP litigation with Yahoo over Overture patents for 2.7 million Google shares. It’s fair to say that GoTo was the seed that launched tens of billions in search revenue, and it is the standard way that all major search engines today make most of their revenue. 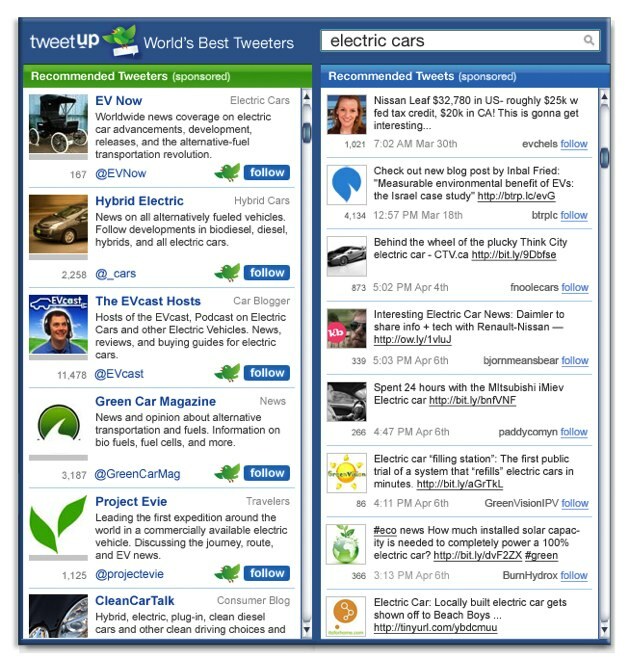 Back to Tweetup: At its core it’s a Twitter search engine with an advertising platform built next to it. The site launches today for potential advertisers only, and the main service will follow in a few weeks. There are three parts to the service – the destinations site, third party widgets, and the advertiser product. The destination site will rank Twitter results by time and via an algorithm to determine if a result should go higher than other more recent tweets containing the keyword queried. And users will also see advertiser (paid) results within that stream as well. idealab is saying that advertisers paying for ranking for specific keywords will also tend to be good results, since bad ads will be bid out of the system. Tweetup says that they are data sharing with Bit.ly to fine tune results, and paid results will always be noted as such. 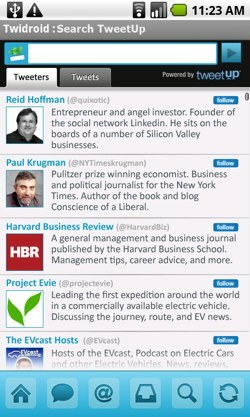 Publishers will also have the ability to add Tweetup directly onto their sites to generate revenue. Tweetup will split revenue from ads 50/50, says idealab, and results will be pre-populated with keywords relevant to that page. They’ve inked a deal with Answers.com and will go live at launch with that and other partners, they say. Advertisers will be able to bid in three ways eventually: by impression, by new follower or by click through to an end URL. At first, says the company, advertisers will only be able to bid by impression, and the minimum bid is 1 cent per impression. The first 1,000 advertisers to sign up will get a $100 credit towards ads. And the signup seems fairly trivial. Give them your Twitter name and your bio is automatically imported; you can edit from there. Will this work? I’ll never bet against Bill Gross and idealab (again). A lot depends on what advertising platform Twitter ultimately unveils themselves. But one thing Tweetup has going for it is it’s bold, and publishers will likely eat it up for the additional revenue stream. 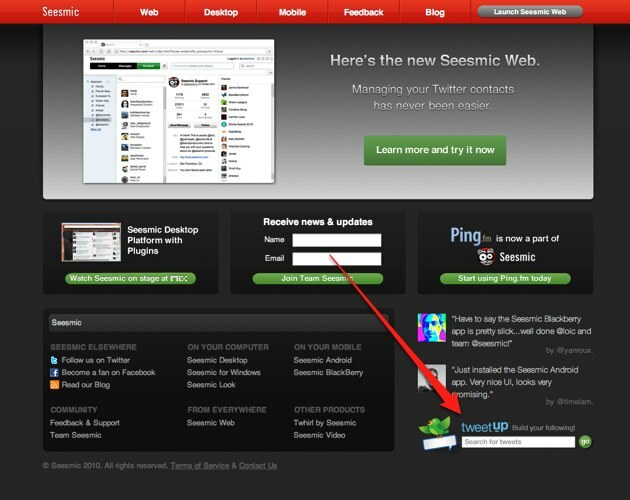 They already have deals inked with Answers.com (mentioned above), Seesmic and Twidroid. And more will be announced shortly, they say. When Bill Gross, idealab’s founder, has an idea it’s usually a very big one. And it often has a little bit of crazy mixed in, too. Investors aren’t waiting to see how this one plays out before jumping in. They’ve closed a $3.5 million first round of funding led by Index Ventures, and have taken investments from SV Angel (Ron Conway), First Round Capital, Betaworks, Steve Case, Jason Calacanis and Jeff Jarvis. Gross is the interim CEO of Tweetup, and Index Ventures’ Danny Rimer is taking a board seat.